It’s time! It’s time! IT’S FEASTING TIME! The Vremi Feasting Time Dinnerware Set ensures you’re prepared when the time for noms is drawing nigh. 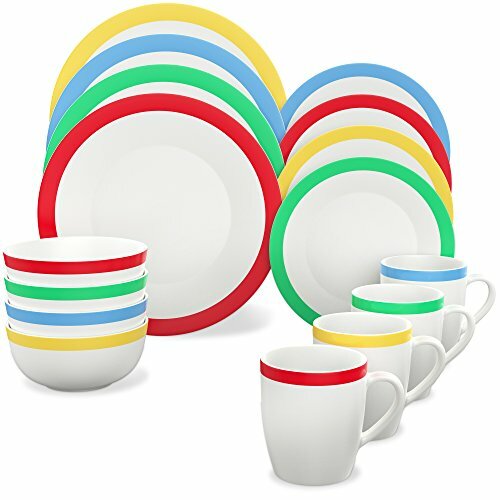 This set comes with 4 dinner plates, 4 dessert plates, 4 bowls and 4 mugs that are made from BPA free microwavable and premium AB-grade porcelain. Simple yet stylish to match any home or dorm. Lightweight construction makes each piece easy to handle for kids and for people with arthritic hands. Perfect for breakfast, lunch, and dinner… and brunch, second lunch, snacks, fourth meal, elevensies, surprise ice cream treats… you get the idea. A great serving companion for every day meals and for fiesta, wedding, Christmas, and birthday parties too!